Fast web downloads, email, ftp file transfers and streaming video and audio are achieved with short term speeds of typically several Mbit/s, using a share of a high bandwidth outlink connection from a large hub station with a composite rate of typically 64 Mbit/s. 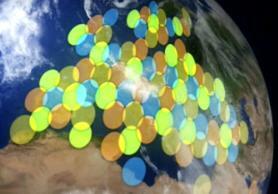 European satellite broadband capacity is almost always shared. Services for home and small office have high sharing ratios, but are much lower cost than services for business where dedicated 1:1 CIR or low ratio sharing is the rule. Service providers have tariffs for various service maximum bit rates and amounts of Gbytes downloaded or uploaded peer month. Email and internet web browsing are the preferred intended use. For applications requiring substantial uploading of data or for video, music or VoIP ask about higher price options. My text about each service provider. Click on the email addresses for current prices and to confirm technical details. 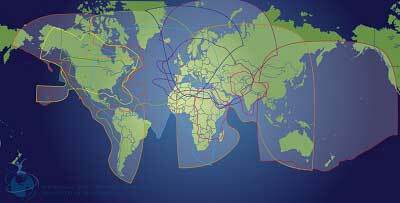 European Satellite Broadband maps include the following countries: Canary Isles, Madeira, Tunisia, Russia, Armenia, Estonia, Latvia, Moldova, Croatia, Slovenia, Macedonia, Albania, Israel, Palestine, Syria, Lebanon. Look at the list of companies at the end of this page as well. If you want your company details added to the site, please tell me with interesting details such as service area (beam footprint), frequency band etc. I am not interested in sales blurb or superlative texts. There is no charge. This is not paid for advertising. Details may be deleted. Services include shared and dedicated internet access, SCPC, mesh, maritime mobile, broadcast, TV and radio. Technologies: iDirect, Newtech, Comtech and Novelsat. Minimum hardware: Fixed: Ku: 1.2m dish. Mobile/broadcast receive Ku: 60cm dish. 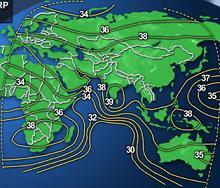 Example, coverage using Eutelsat 70B Widebeam and Yamal-402 Northern Ku-band Beam in Europe and Baltic countries. 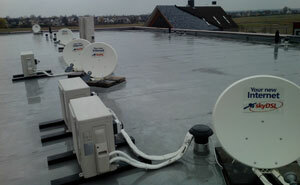 This company is a reseller in the Netherlands for Tooway, Skydsl, Astra2Connect and Broadsat Africa services. Installations in the Netherlands and the border area between the Netherlands and Germany and the Netherlands Belgium. 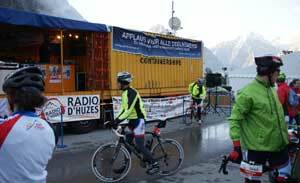 Connection in France during Alpe d'Huzes, a Dutch event to raise funds to fight cancer. Office building with 5 companies. They needed internet, cable and dsl was not there. This image shows the UK based Hylas 1 satellite beams, using the latest HughesNet HN9600 technology. Hughesnet and ViaSat Surfbeam routers provide fast, flexible business and consumer broadband access up to 20 Mbit/s. Consumer terminal pricing is affordable with wide range of monthly tariffs to suit customer usage. It is sound, proven technology which simple ethernet interface. No additional customer software is required. Satellite broadband provided total independence from terrestrial infrastructure and no phone line required. The HughesNet service, based at Goonhilly, UK has UK based IP addresses. Both Tooway© and Hylas operate in the new Ka band and the small precision antennas are intended and well suited to self-installation, similar to satellite TV antennas. Simple customer interfaces: Plug and play Ethernet 10/100 Mbps. LAN network interface. There are many tariff options for home and business users, download speeds are up to 22 Mbit/s and upload speeds are up to 6 Mbit/s. Different tariffs offer different traffic quotas. The monthly quotas for each tariff ranging from 2 GByte/month to 200 GB/month. Go to http://www.bentley-walker.com/ for prices and tariff option details. For higher resolution details of individual European satellite beam coverages, click on the map above right to go to a detailed interactive map at the Isotropic web site. 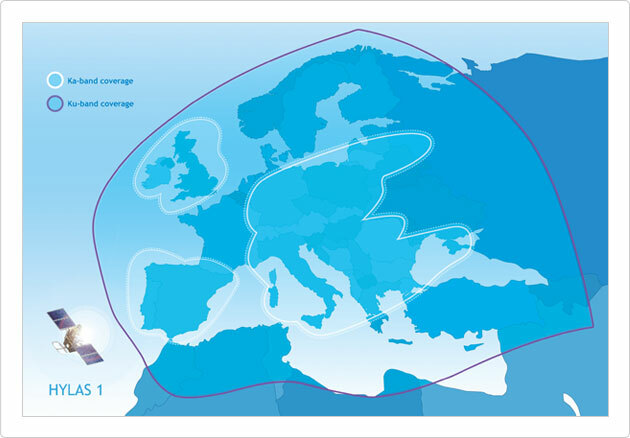 Connectivity in Europe using Telstar 11N. Established in 1994, this company and the owners have many years of experience in designing earth stations for some of the biggest telecom companies including Inmarsat, BT and Teleglobe. They specialise in providing satellite internet connectivity for fixed and temporary connections, especially where the requirement is complex or involves company networks. The company is good if you need technologies such as streaming video or audio, WiFi hotspot, high data-rate with low contention. Also, for applications needing low bandwidth (such as monitoring and control of remote assets), they will work out a tariff that reflects the lower resource usage. Orbit Research Ltd owns and operates an iDirect 5IF VSAT hub at the SMS-Teleport in Rugby, UK. The Orbit iDirect 5IF hub can host VNO (Virtual Network Operator) operations as well as providing connectivity for individual satellite terminals. Regions and Countries covered (but not limited to): All ex-USSR (CIS), including Ukraine, Russia, Armenia, Azerbaijan, Moldova; All Europe, including Germany, Greece, Austria, Switzerland, Croatia, Serbia-Herzegovina, Bulgaria, Romania, Italy.
. DVB/RCS LinkStar based Services for individual home user up to dedicated high bit rates for big business. The customer satellite broadband VSAT comprises a parabolic antenna dish, similar to satellite TV, together with an indoor satellite internet modem. Ethernet cable connects to your PC or local LAN router, typically wireless. Many local PCs may be connected. The arrangement is suitable for both home use and for small office / internet cafe type applications. Radio modules on the front of the dish receive the out-link (or downlink) using a conventional LNB (low noise block down converter) and transmit the return link (or uplink) data using an outdoor transmit block up converter (BUC). The satellite broadband connection is always-on with direct access and is not dependant on dial up or ADSL lines. The most recent outdoor equipments have the transmit and receive function integrated on one module called a TRIA (Transmit receive integrated assembly). The teleport hub dish is where the VSAT Operator and satellite ISP is located with a very high speed optic fibre digital backbone for worldwide networking connection. Ku band refers to 11-12 and 14 GHz operation. C band (4/6 GHz) needs generally larger customer antennas but suffers less from heavy rain fading in the tropics. Ka band and small satellite spot beams is the most modern technology and uses frequencies in the 20-30 GHz range. Have your say now. Please provide feedback about your service provider. Help others with advice. Contribute your own problems, successes, failures, wants, sales etc. This web site is simply intended to be helpful, it does not use pop-ups, flash or other nonsense. There may be errors on this page. 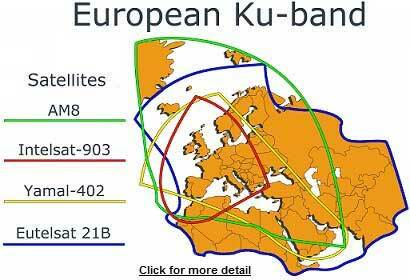 The setting up and control of satellite broadband VSATs in Europe is controlled from the hub providers so any problem sites can be switched off remotely until a technician attends. Also, the equipment design and frequency bands comply to European regulatory "type approval" for general use so that operation does not cause unacceptable interference to other services or continue to require individual licence / licensing for VSAT internet access. Non-approved terminals continue to require individual licensing.